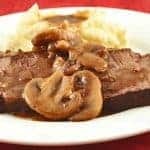 Tender and juicy, with a rich mushroom flavor, this slow-cooker pot roast is a favorite for an easy Sunday dinner. 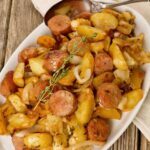 It requires a bit of work before you can turn on the slow cooker and walk away, but the end result is definitely worth the trouble. We start with a boneless chuck roast (read more below), simply seasoned with salt and freshly ground black pepper. Then, to develop depth of flavor for this hearty dish, we make a variation on a mirepoix. If you’re not familiar, mirepoix is a French term for a blend of diced onions, carrots and celery sautéed in butter. Mirepoix is used as a flavor base for many types of recipes including sauces, stews and soups. 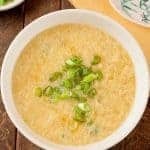 The variation we use here also includes some garlic and mushroom stems for extra flavor. Combined with beef broth and red wine, this mix of aromatic vegetables infuses flavor to the roast and makes a rich, savory gravy as well. Baby potatoes and mushrooms cook along with the roast, and a hearty vegetable like our Oven-Roasted Brussels Sprouts help to round out a delicious, balanced meal. For drinks, try a full-bodied red wine like Cabernet Sauvignon and for those who prefer beer, choose a dark variety like a porter. What’s The Best Cut Of Beef To Use For Pot Roast? 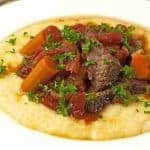 Although grocery stores often label various cuts of beef as “pot roast,” the term actually refers to the cooking method and not a specific cut of meat. 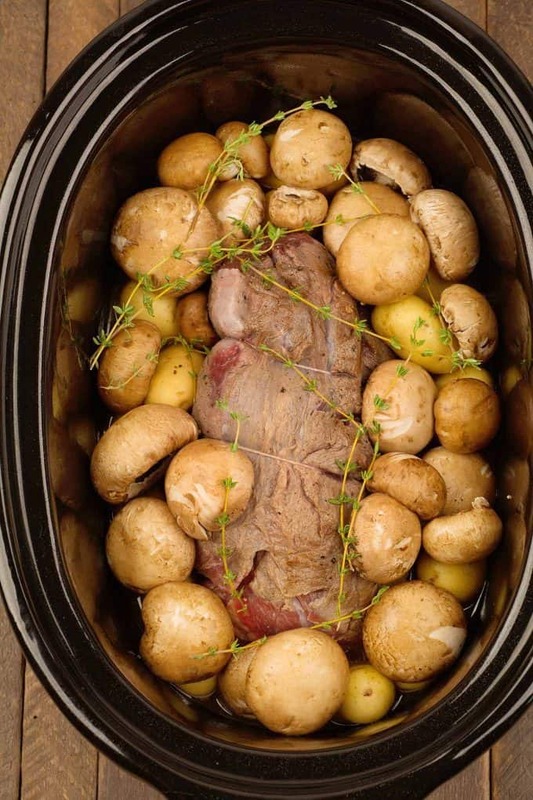 When making pot roast, you always want to choose a tough cut of meat and plan to cook it slowly and at a low temperature. Tough cuts of beef are reasonably lean and contain a lot of connective tissue that breaks down into gelatin during cooking. That gelatin is what gives pot roast its melt-in-your mouth richness and beefy flavor. If you find a piece of meat labeled “pot roast” at the market and are unsure of what the cut is, ask the butcher. 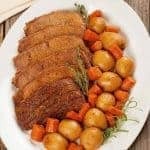 While rump (or bottom round) roasts are an acceptable choice for this and other pot roast recipes, in our experience, boneless chuck roast is a better option. Boneless chuck roast comes from the shoulder portion of the animal and is sometimes called a shoulder roast. Rump roasts come from the more muscular outside of the back leg. The reason we prefer the chuck roast is that, while still considered lean, it does contain a little more fat and connective tissue than the rump and that translates to a juicier, more tender pot roast. 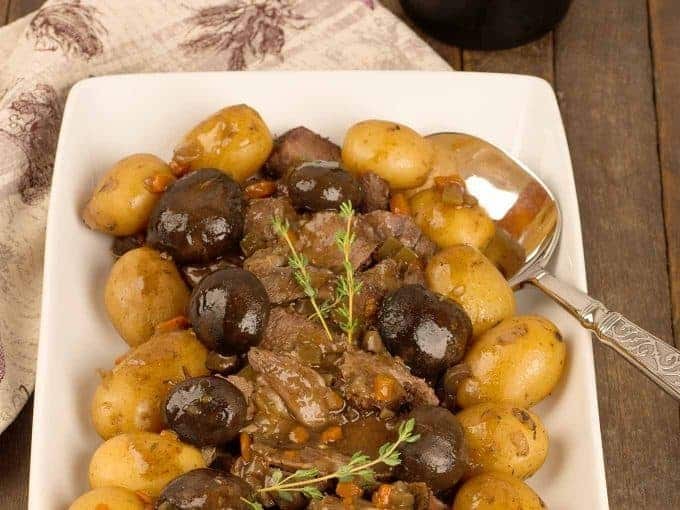 Tender boneless chuck roast, baby potatoes, mushrooms, red wine and fresh thyme combine to make this slow-cooker pot roast recipe a company-worthy Sunday meal. Rub the outside of the roast with olive oil and season liberally on all sides with salt and freshly ground black pepper. Heat a small amount of olive oil in a large skillet over medium-high heat. Add the roast and brown on all sides, 5 to 6 minutes total. Transfer to a plate while you prepare the vegetables. Clean the mushrooms, separate the stems from the caps and chop the stems. Set aside. Sauté the onion in olive oil until softened, 4 to 5 minutes. Add the carrots and celery and sauté until the all the vegetables are lightly caramelized, 3 to 4 minutes longer. Add the chopped mushroom stems and garlic and cook for an additional 1 to 2 minutes. Combine the beef broth, red wine and Worcestershire in a measuring cup. Deglaze the pan with 2 tablespoons of that liquid, scraping up any browned bits that may have accumulated on the bottom. Transfer the vegetable mixture to the slow cooker, spread evenly over the bottom and add a few sprigs of thyme. Place the roast on top and arrange the potatoes and mushroom caps around it. Add the remaining thyme sprigs and pour the broth and wine mixture over the top. Cook on low for 8 to 9 hours (high for 5 to 6). Once done, transfer the roast to a cutting board and tent loosely with foil to keep warm while you make the gravy. Discard the sprigs of thyme and pour the cooking juices (including the veggie mixture) into a large measuring cup. Use a spoon to skim any visible fat from the top. Transfer 1-1/2 cups of the juices to a small saucepan and bring to a boil over medium-high heat. 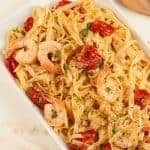 Whisk 2 tablespoons cornstarch into about 3 tablespoons of cold water until smooth. Stirring constantly, gradually add the cornstarch mixture to the pan juices. Cook for 1 minute until thickened to a syrupy consistency (do not overcook). Remove from the heat. 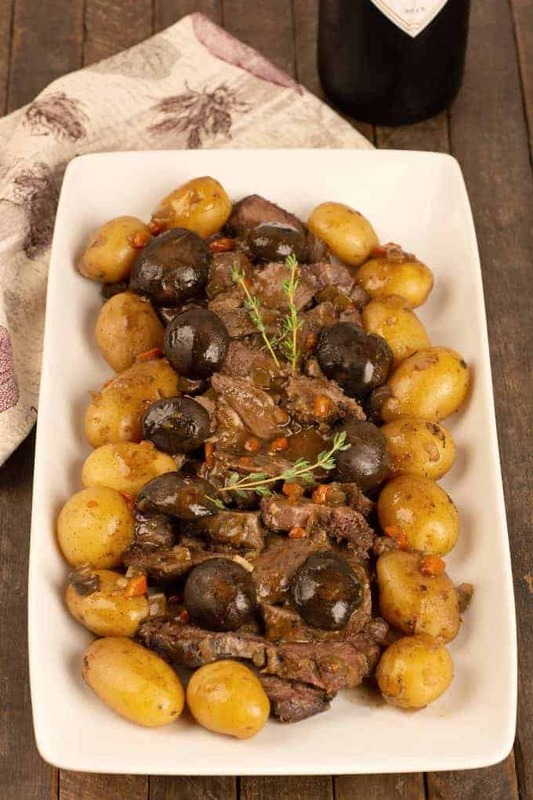 To serve, carve the roast, arrange the slices on a platter with the potatoes and mushrooms and spoon the gravy over the top. When purchased already boned, a chuck roast should be tied to help the roast keep its shape during cooking. If your butcher hasn’t done this already, simply form it into a roast shape and run a few pieces of kitchen twine around it to hold it together. 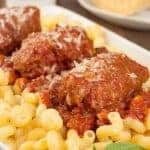 I made this recipe last night and really enjoyed it. 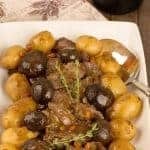 I almost always put tomatoes in my pot roast and stews, and this one was a nice change with the mushrooms. I did use regular yellow potatoes cut up instead of baby potatoes and they worked out fine. So glad you liked the pot roast – thanks for letting us know. I generally use tomatoes in this type of recipe too, but the mushrooms are a nice change for sure.